This is an example of 75% Flawless Paint Correction. Paint correction, in simplest terms, is removing defects from a vehicle's paint. Wax and glazes can make a vehicle look very nice for a while as they fill in and cover up imperfections. However, paint correction is the process of actually removing the defects by leveling the clear coat through wet sanding, compounding, and/or polishing. We offer a 75% flawless paint correction or a 90% flawless correction. A big part of paint correction is what it is not. Paint correction is not a new paint job (although, depending on the subject vehicle, the results may be close, or better!). 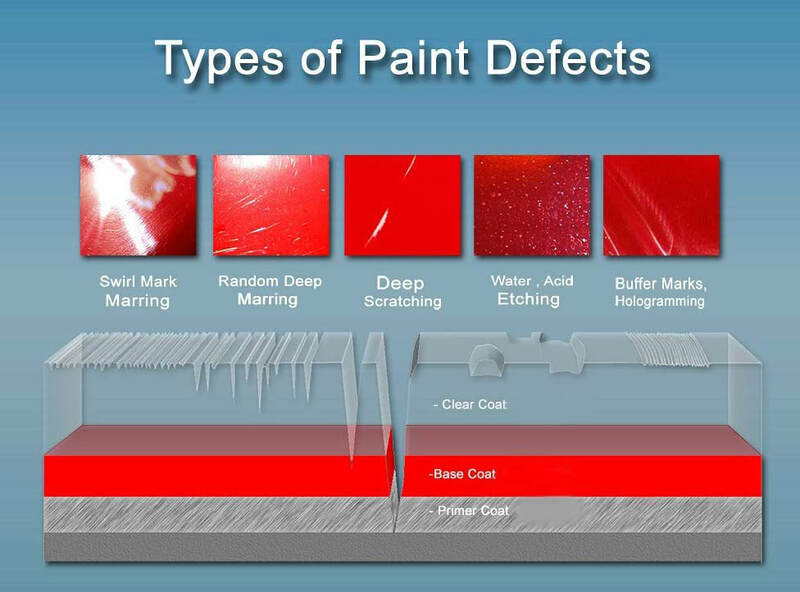 The picture illustrates the types of issues common to automobile paint. The depth of the issue(s) determines the amount of time and risk involved in the correction. This is an example of 90% Flawless Paint Correction. Contact us to schedule a time for us to examine your vehicle and give you a firm estimate.